TS DEECET 2019 Provisional Allotment and Payment Service For Left Over and Non-Reported Vacancies, Download Final Admission Letter (Left Over and Non-Reported Vacancies) TS DEECET 2019 Final Phase Web Options,certificates Verification for Left over Vacancies TS DEECET 2019 Phase-3 Final Allotment Letter download , College Wise Allotment List (Phase-III), Fee details for D.Ed Course TS DEECET 2019 Seat Allotment Order/ letter, Admisssion Fee Challan Details @ tsdeecet.cgg.gov.in tsdeecet.cgg.gov.in TS DEECET 2019 Seat Allotment Order Download Telangana DIETCET Admission Letter 2019 Fee Challan TS DEECET 2019 Web Counselling Result Seat allotment orders download DIETCET 2019 TTC Telangana DEd Admission Letter available @tsdeecet.cgg.gov.in. TS DEECET 2019 Final Seat allotment Letter/ Order, Fee details for D.Ed Course TS DEECET 2019 Final Seat allotment Order, TS Deecet 2019 Admit cards, Provisional admission letter, Seat allotment list . TS Deecet 2019 Allotment Order Download Dietcet tsdeecet.cgg.gov.in. TS Deecet 2019 Allotment Order Download Telangana Dietcet TS Deecet 2019 Seat Allotment Order Copy Download, Telangana Dietcet 2019 Allotment order, Admission Order Download, TS Deecet Allotment Order Download, Deecet Allotment TS Dietcet Seat Allotment order TTC 2019 College Admit Card Download TS Deecet Seat Allotment Order Dietcet Allotment Order Download.After completing the web options process AP Deecet seat allotment order will be generated at Official website. TS DEECET College wise Seat Allotment List 2019, Provisional allotment Letter/Provisional Seat allotment Order/ Provisional Admission Letter: Allotment of seats for admission into Two Year D.El.Ed Course in the State for 2019‐19 batch will be made through Web Based Counseling as per Rules in the order of merit as per the rank obtained in DEECET 2019. The process of admission involves three stages: 1. Online submission of preferences of colleges through Web Based application. 2. Allotment of seats, 3. Download of Allotment Letter. Submission of preferences through Web Based Counseling is not the end of admission procedure. It is only registration for admission. Allotment of seats will be made exclusively in the order of merit through a web based programme. All the candidate who are allotted seats in any of the colleges as per merit and the order of preference of colleges will be sent through SMS on their mobile. Candidate shall visit the website http://tsdeecet.cgg.gov.in to know ‘provisional allotment’ and make fee payment as mentioned therein. 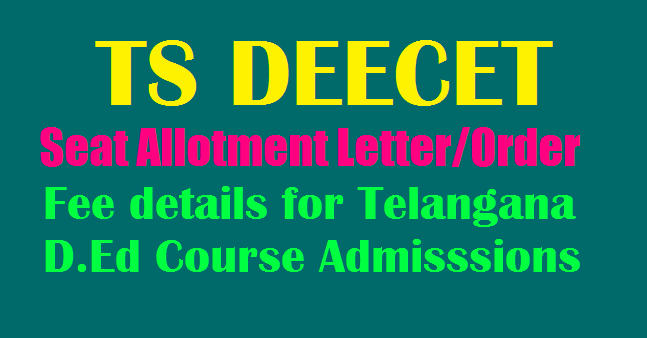 TS Deecet Seat Allotment Order Dietcet Allotment Order Download Telangana Deecet Seat Allotment Order Dietcet Allotment Order Download Telangana TTC 2019 College Admit Card Download. 2. On the home page check for the TS DEECET Allotment Order Link. 3. Click on the link and enter your details. 4. Then Admission Letter is displayed on the screen. 5. Download the Admission letter and save the file. 6. Finally, take a print out of the copy for future use. 8) Special Category Certificate issued by the Officials concerned for claiming admission under quota of reservation for Special categories (Defence personnel or their children and spouses, NCC, Rashtrapathi Awardee Scouts and Guides, Sports and Games). The candidates belonging to the following categories are exempted from payment of fee provided they have produced the income certificate of parents issued by the Tahsildar after 01‐01‐2019 for claiming exemption of fee at the time of verification of certificates. 11) The copy of acknowledgement of fee paid through gateway should be submitted in the allotted college on the day of reporting at the college . 12) The Principal / Correspondent of the concerned college shall submit the list of candidates reported in the college to Principal, Govt. DIET concerned on 21‐08‐ 2019 without fail failing which the college will not be included in the 2nd phase of counseling and further action will be initiated as per rules. 13) On receipt of list of candidates from college in the respective Districts, the Principal, Govt. DIET shall report to the CGG, college wise through tracking service.